ZW-7 is a firm lumbar support, with four flat, semi-rigid stays and built-in elastic straps to pressure the abdomen and enhance the lumbar support. Inner straps encourage stability by firmly immobilizing the lower back. Sizes are based on the circumference of the waist at the naval. 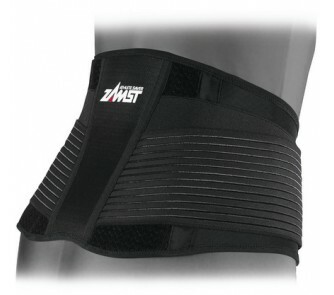 ZAMST is a pioneer and leading innovator in the world of sport orthoses. Their high quality, technologically advanced braces and supports are designed to provide ultimate functionality while keeping respect for the specificities of athletic movements and limitations. 35 years of medical experience and constant collaboration with doctors, coaches and professional athletes ensure ZAMST products are the most comfortable, effective, and durable support products on the market. Each product is very precisely designed, utilizing up to 22 parts, 18 different materials, and exacting finishing touches to maximize effectiveness and ease of use. They have been the leading brand in Japan for 15 years, and today only ZAMST is able to offer top of the line orthoses designed specifically for athletes.